The tube map includes several blobby interchanges where TfL claim you can change from one line to another. But there are only four places where stations with different names are linked with black lines to indicate that interchange is possible, even recommended. I've been out with a stopwatch to discover how long each takes. Please note: All of these times are from front of station to front of station, not from gateline or platform. I tried walking these connections on a Sunday, so there wasn't much traffic around and crossing roads didn't hold me up. I walk fairly fast and I always walk up escalators. Consider these minimum interchange times - you'd probably take longer. This is a simple stroll down Wood Lane, past what used to be Television Centre shrouded in sheeting and scaffolding. Unless you're buying a flat there, try not to look. A poster in the ticket hall at Clapham North claims that this interchange takes "approximately five minutes". Given that I completed it in less than half that, without running, I think this gives you some idea how conservative TfL's timing estimates are. Admittedly I was lucky with the traffic lights, but then it was just a simple zig and zag past the cafes in the railway arches. I timed this from the top of the escalator at Tower Gateway - it'd be 20 seconds quicker from the front of the station proper. Or it could be over a minute slower if you hit the traffic lights at the wrong moment, the stream of vehicles is quite relentless. Temporarily, while Balfour Beatty attempt to build a hotel, this link takes almost twice as long in the opposite direction. Access from Tower Hill's main exit is currently restricted, with a series of signs diverting punters down to Roman Wall level, along to the souvenir shop and then back up the other side. The whole thing involves rather a lot of steps, hence the additional minute and a half. And yes, some interloper company really is in the middle of plonking an ugly new hotel on top of Tower Hill tube station. Their cash should mean step-free access to the platforms, eventually, but the new building's not going to enhance anybody's photos of the Tower. This is my local connection, so I know it well. Newcomers to Bow Road often seem far less sure, however, there being gaps in the signage down the street that cause would-be connectors to doubt they're going the right way. Many are thrown by the sight of a very obvious railway bridge partway between but with no obvious station attached... a historical red herring. Almost once a month I have to stop to help a poor lost soul on their way ("No, really, carry on, it's just down there"). And then there's the cablecar - isn't there always? Its terminals aren't really stations, but they do appear as out of station interchanges on the tube map, so I should include them here. It takes just over four minutes to walk from the Dangleway booth at the top of the escalators across Peninsula Square, past Tesco and then across the car park exit road. I was amused/saddened to see that the Dangleway booth was fully staffed yesterday, even though the cablecar was undergoing its annual maintenance closure. Meanwhile, somewhat ironically, North Greenwich's proper ticket office closes forever today. The cablecar's northern end links more closely to the rail network, even though there's a whopping great housing development in the way. Following the official signs round the edge is marginally quicker than taking what looks like a shortcut between the buildings. But that really is the lot. Every other interchange marked on the tube map is either within the same station, or between separate stations with the same name (eg Hammersmith → Hammersmith, Paddington → Paddington, West Hampstead → West Hampstead, Canary Wharf → Canary Wharf). I'm not including Bank → Monument in this list either, because the entire interchange is within the station complex. It takes a whopping 6m 15s from the Central line at Bank to the eastbound District line at Monument, following the official 'up up down down down along up along up up down' route, should you ever be tempted. And then in May we'll get three more. A clump of new Overground lines (to Enfield, Cheshunt and Chingford) and the beginnings of Crossrail are being added to the tube map, which means three more out of station interchanges will appear. Here's where. This is an interesting one. Hackney's two main stations sit at opposite ends of Amhurst Road, one on the existing Overground, the other on the line into Liverpool Street. When this is also transferred to the Overground, TfL intend to convince us it's fine to walk from one station to the other by slapping a pair of black connecting lines on the tube map. It doesn't feel easy at present, pounding pavements and crossing a car park to get from one to the other. But that's because a much better, cleverer and more direct interchange is planned, and won't require touching a pavement at all. Hackney Downs' platforms extend to the south, towards Hackney Central, and Hackney Central's platforms extend similarly to the west. A footbridge is therefore planned, a mere 150m long, to link the two. It'll run alongside the Stansted-bound railway, behind the flats on Malpas Road, linking HD platform 1 to HC platform 2. And it's scheduled to be completed next month, or at least it was when the contractors crowed about their new project last June. The current state of affairs suggests otherwise, with no elevated walkway apparent, nor any attempt to create a link at either end. 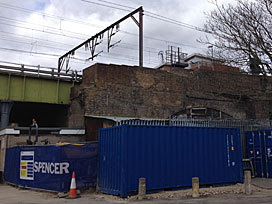 There is a large worksite behind a blue wall, and various containers are scattered in promising locations, but someone needs to get a helluva move on if this Overground to Overground connection is to be complete by 31st May. This is an intriguing one. The long-awaited shortcut between WC and WQR finally opened last summer, saving several minutes, but has yet to appear on the tube map. There's a proper Victoria/Goblin interchange at Blackhorse Road, one stop along, so why advertise this lesser link to the wider world? But once the Chingford line switches to the Overground in May, the existence of a Walthamstow interchange will become more important, and an ugly black bar will be added to the map. You'll have to exit from Walthamstow Central's minor southern exit to find the link, and the route's still not officially signed along the way, but this is a useful connection all the same. This one already exists as a quick walk down Woodgrange Road, plus as long as it takes to cross the traffic lights on Forest Lane. Whilst Wanstead Park has been on the tube map since November 2007, Forest Gate is currently a mere National Rail station so doesn't count. But it's going to be part of Crossrail, and the Shenfield arm is scheduled to arrive on the tube map in May as the operating company changes hands. And finally, here are two out of station interchanges that perhaps ought to be on the new tube map, but won't be. It'll look on the map as if the Enfield line doesn't link with the Gospel Oak to Barking line, whereas in fact it almost does. It nearly links at Seven Sisters, requiring a mere four minute cut through the Stonebridge Road Estate to reach South Tottenham, but sssh, that's top secret. The appearance of two completely different Bethnal Greens will be one of the new tube map's more peculiar features. The 'new' Bethnal Green will be on the Overground, and completely separate from the Central line station which is six minutes walk away. The difficulty of squeezing in so many new lines means that Bethnal Green (Overground) will appear to the north of Bethnal Green (Central) on the map, whereas in reality it's to the southwest. Bethnal Green (Overground) is also a similar distance from Whitechapel, but these two stations will appear absolutely nowhere near each other when the new map is published. But then the tube map never was about reality, which is fortunate, because it increasingly isn't. Aldgate → Tower Gateway, Archway → Upper Holloway, Brondesbury → Kilburn, Camden Town → Camden Road, Canary Wharf → Heron Quays, Dalston Junction → Dalston Kingsland, Edgware Road → Edgware Road, Euston → Euston Square, Finchley Road → Finchley Road & Frognal, Hanger Lane → Park Royal, Ickenham → West Ruislip, Kentish Town → Kentish Town West, Kenton → Northwick Park, Lancaster Gate → Paddington, Leytonstone → Leytonstone High Road, Manor Park → Woodgrange Park, New Cross → New Cross Gate, Seven Sisters → South Tottenham.